I’m glad to welcome back my friend Heidi to share her favorite tips on how and why she meal plans one month at a time. 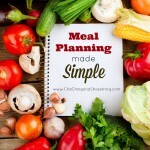 Plus I love the free meal planning printable that she created for us! A strange irony of my life is that meal planning has become one of my least favorite tasks, yet I love to cook. Anyone else feel that way? I don’t fully understand why it has become so hard to force myself to take the hour (really that’s generally how little time it takes) to follow through with it because when I do, our household runs so much more smoothly. When I don’t, the idea of cooking dinner for my family becomes a downright drag. 1. I only have to spend time planning every 30 days or so. 3. I like to shop at Costco once a month to get the bulk of my groceries and go to ALDI to pick up smaller items or produce on a weekly basis. 1. At the end of a month I pull out my printable meal planner and start filling in meals for the upcoming weeks. This is the first week of March so I spent an hour last week to plan for this month. 3. Since I’ve declared Saturdays to be “Soup Saturdays” in our house, I go ahead and fill in every Saturday with my go-to soups. 4. I like to make a crockpot meal once a week and I choose to do that on days I know are busy. Right now I work on Monday and Thursday, plus my daughter has ballet after school on Thursday – so that’s my crockpot night. I go ahead and fill in each Thursday with a crockpot meal. 5. I want Fridays to be easy. Pizza & a simple salad helps to keep things relaxing after a long, busy school or work week – I go ahead and fill that in on Fridays. 6. I’m trying to experiment with more meatless meals. Eating vegetarian once a week saves us money and keeps things healthy – I go ahead and fill in a meatless meal once a week. 7. For the remainder of the days, I look at the meals that my family likes to eat and try to match up ease or difficulty of the recipe with a busy or slow day (this may not always work because life can change in a flash but the idea is there). 8. With all this cooking there is always enough food for a leftover day – for us it’s Sundays. Kids are hungry after church and if I can quickly heat up some leftovers everyone is well fed and ready to relax while my youngest naps. 9. After I fill in my planner with our menu, I go through my recipes and make a master list of things I need at Costco, Aldi or another grocery store if I need to pick up some specialty items. 10. With this method I always have what I need to make a variety of meals. Often I have enough food to spill into the next month a little bit too. Life happens, plans change so sometimes we don’t always stick to this exactly but the bottom line is that I don’t have to stare into the fridge or the pantry and say “there is nothing to eat…”! I choose to only plan for dinners. I have a big list of staple items that I purchase at Costco or ALDI and these items are great for daily breakfast and lunch which tend to be more basic in our home. If I decide I’m going to do something special for either of those things I can just add that to the notes section at the bottom of the planner. The joy of this method is that I only have to think hard (about dinner) once a month. So while this does take some time up front, it ultimately saves money and more time later on! 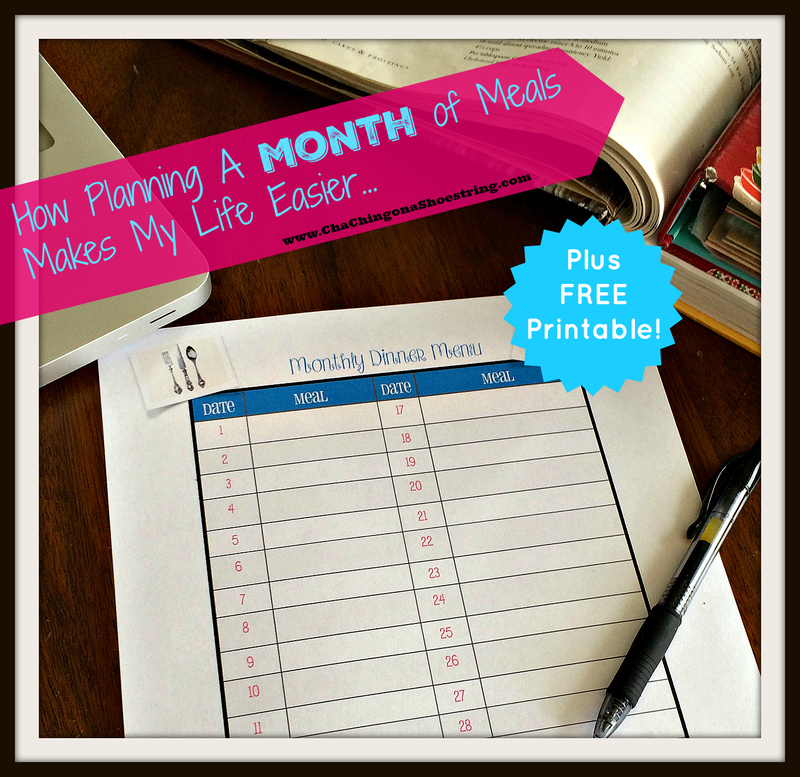 Want to try monthly meal planning? 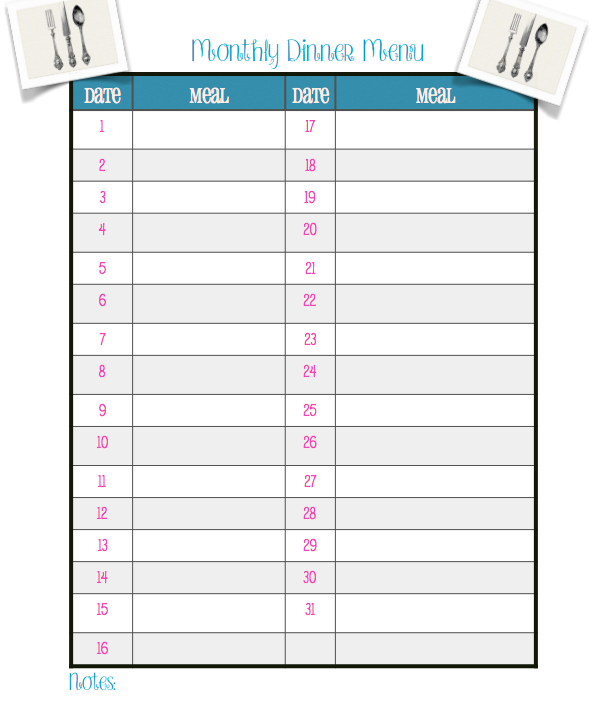 Click here to download your free meal planning printable! How do you meal plan? If there’s one thing I’m learning these days, it’s that I always have a lot to learn! And when it comes to meal planning, I think we could all learn a lot from each other. So I’d like to know: What are your meal planning tips and tricks? 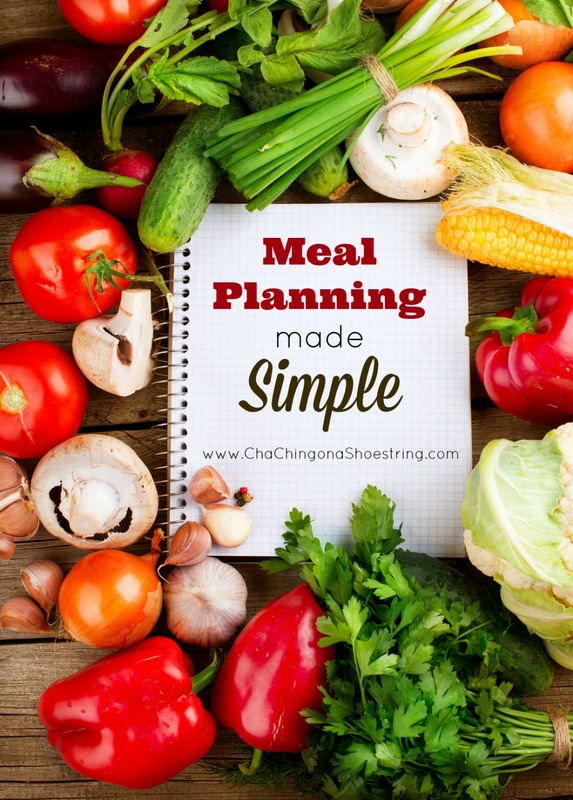 Do you have any suggestions on how to simplify meal planning? What are your best tips for meal planning on a budget? I am always trying to improve in this area, so I’d love to hear from you! As for me, if you’ve been around here for long, you know that I’m a faithful eMeals subscriber. I’ve tried a variety of their plans, but I always seem to come back to the ALDI Classic Meal Plan since I do most of grocery shopping at ALDI. 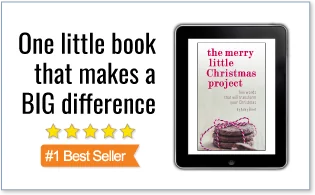 (By the way, you can enter to win a $25 ALDI gift certificate here!) 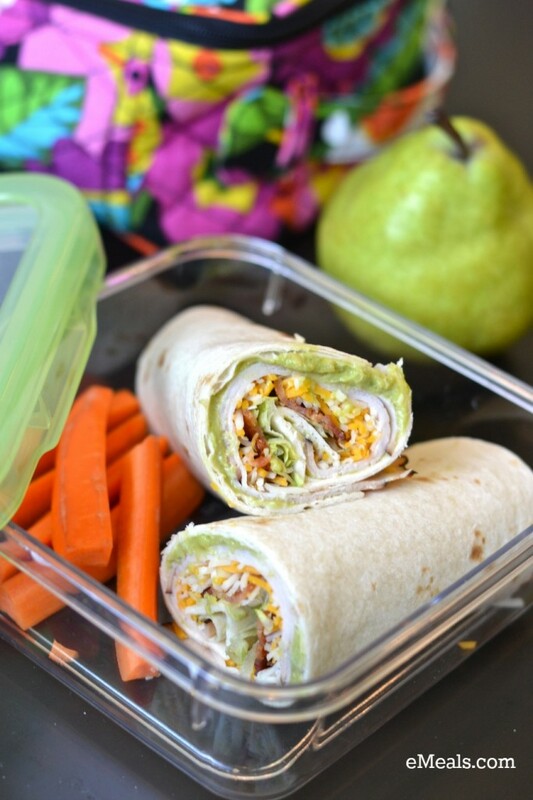 I like the simplicity of the meals and so do my kids, so it’s a win-win! -And in the summer, we are all about the GRILL, all the time! I’m also loving my new trick with my KitchenAid Mixer that helps me cut my meal prep time in half! I find that by incorporating some quick and easy meals into my regular meal plan schedule, I can be prepared when I don’t have the time or energy to make a new and different meal. It also helps me to stretch my grocery shopping to two weeks between trips. That’s it. Nothing fancy. Just how I like it! *NEW* eMeals FREE Trial – Try it FREE for Two Weeks! How does eMeals FREE Trial work? If you’ve been around here for long, you’ve heard me share about my love for eMeals meal planning service. It has been my meal-time sanity saver for over 5 years now. Click here to head over to eMeals and select which meal plan you would like to use. Choose from a long list of plans including store-specific, dietary-specific and tailored to your family size. Sign up for your meal plan/time frame of choice and and start using it right away. Either print your meal plan/grocery list and head to the store or simply access them from your Apple or Android Smartphone! Enjoy the free trial for two weeks. If you decide eMeals is for you, just continue using the service at as low as $4.83 per month. If you decide it’s not right for your family’s needs, then just cancel your membership online before the 2 weeks are up and you won’t be charged a thing. You can also opt to change the type of meal plan if you’d like to try something else. I’ve done this multiple times over the course of my membership. Click here to try eMeals for FREE! Not familiar with eMeals? 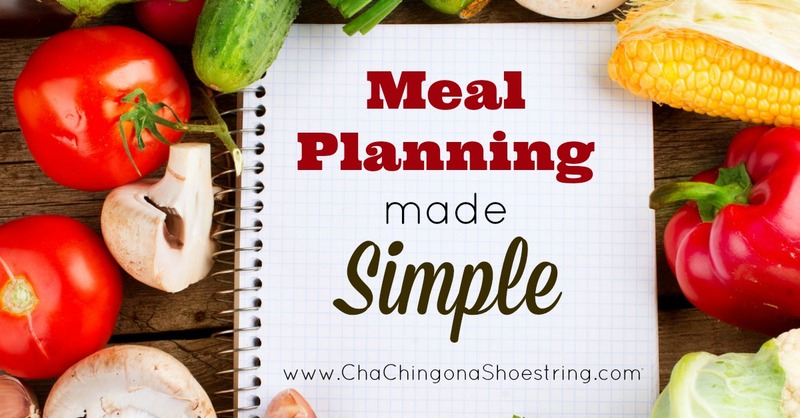 Click here to read more about why I am such a fan of this meal planning service. 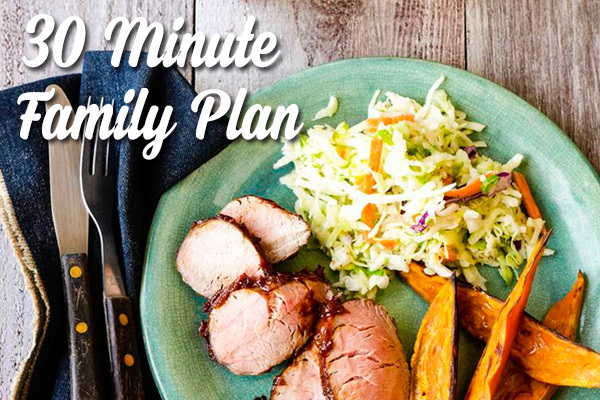 eMeals just launched a brand new 30 minute Family Plan and I could not be more excited about it! I’ve already switched my current subscription over to give it a try and am loving what I see. Easy peasy and yummy meals – the best combo! Not familiar with eMeals? Check out my eMeals review and don’t forget that you can currently try eMeals for two weeks for FREE! Don’t miss your opportunity to give eMeals a try. Check out all of the eMeals meal plans to see which one might best for you. eMeals Coupon Code: Save 20% plus a FREE Back to School Survival Guide! Update: The coupon code has expired, but now you can sign up for a FREE 2 week trial of eMeals. This is a fantastic way to find out if eMeals is right for you. If you decide it isn’t, just cancel before the 2 week period has ended with no obligations! Just in time for Back to School season, there is a new eMeals coupon code available to save 20% off your entire purchase! Use code SCHOOL to claim your discount at checkout. This makes meal plans as low as $3.87 per month! This is one of the best offers of the year from eMeals. I am a HUGE eMeals fan and have been a subscriber for about 5 years now. Check out my eMeals review and learn how eMeals has saved me thousands of dollars through the years. In addition to the 20% promo code, you will also get a FREE Back to School Survival Guide with your purchase, which includes essential recipes for breakfast, lunch boxes, easy weeknight meals and more. Layer turkey, bacon and cheese on each tortilla. Add lettuce, if desired. Roll up tortillas, and cut in half. Check out all of the eMeals meal plans and sign up for a FREE 2 week trial! I remember when my husband and I were first married. I tried so hard to enjoy meal planning. I spent hours writing out menu plans and filling a folder full of cute little meal planning calendars, creative ideas clipped from magazines and a whole lot of other organizational tools intended to motivate me to become the meal planning guru I thought I should be. Then came 2008 – that was the year I was expecting our second son and it was also the year that my husband was suddenly laid off. Suddenly saving money on groceries and meal planning was less about being super-mom and more about surviving our lack of income. That was also the year that I bought my first eMeals subscription. If the fact that I started paying for a meal plan after my husband lost his job seems backward to you, I understand. But may I remind you of the old adage – “Time is money”? I’ve been an eMeals subscriber for almost four years now. 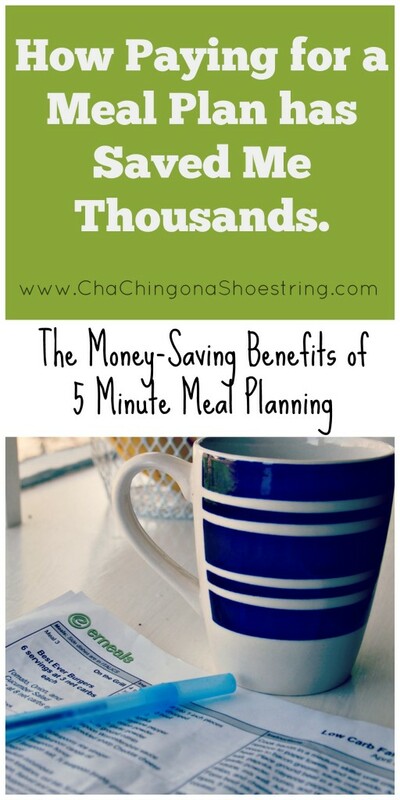 That’s hundreds of hours I haven’t spent meal planning, grocery-list making, and scouring Pinterest for ideas on how to spend less time meal planning and grocery-list making. It’s also hundreds of hours I have spent finding other ways to save money – couponing, deal-hunting, freebie-finding, and earning extra cash online. By trading the time spent on meal planning for time spent saving my family money in other ways, I can only guess that I’ve save thousands of dollar since I started paying $5 per month on eMeals. Talk about your return on investment! 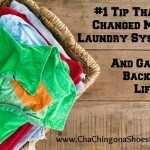 And now that I am an even busier Mom of three boys, saving time has become an even greater priority for me. Not to mention, finding a plan that fits my family. …and so much more. Not to mention, many of these meal plans are created around the weekly sales at stores like ALDI, Walmart, Kroger, Safeway, Target and more. Sign me up for the eMeals lifetime subscription please. Tired of menu planning stress and dinnertime insanity? Right now you can sign up for a FREE 2 week trial of eMeals. This is a fantastic way to find out if eMeals is right for you. If you decide it isn’t, just cancel before the 2 week period has ended with no obligations! Click here to select a menu plan that fits your family. Learn more about eMeals here. eMeals Costco Plan plus Coupon Code – Save 15%! Great news, Costco shoppers. eMeals now has a Costco plan! It’s a bi-weekly plan which means you’ll receive a new menu and shopping list once every two weeks to help you get the most out of buying in bulk. The plan will contain two weeks of dinners and side dishes. Plus through 1/31, eMeals is offering 15% off your order when you enter coupon code DINNER15 at checkout, which will make this Meal Plan/Grocery List service as low as $4.10 per month! 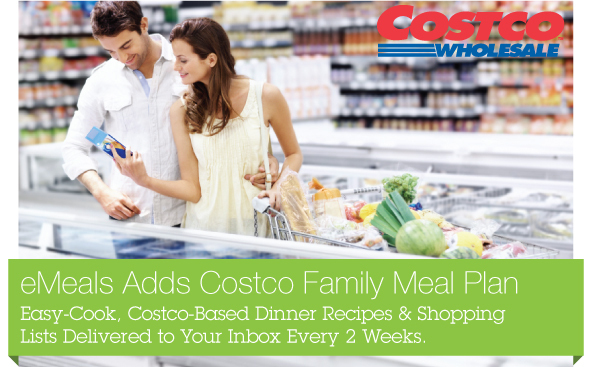 Click here to check out eMeals Costco plan. I’ve been a faithful eMeals subscriber for over 4 years. 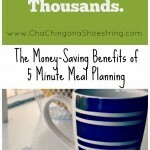 Click here to learn more about my love for this amazing, time and money-saving meal planning service. Trying to eat healthier in the New Year? Did you know that eMeals offers the following menu plans? In addition, you can sign up for the Paleo 7 Day Challenge or Clean Eating 7 Day Challenge and get a FREE week of breakfast, lunch, and dinner meal plans to jump start you into action! Click here to check out eMeals.